“Steel yourself” for the future is an old idea that is taking on new meaning. Steel is the #1 recycled material in North America. There is more steel recycled every year than aluminum, plastic and glass combined. Each year approximately 10 million vehicles are recycled (enough to circle the earth about 1 and 1/2 times). Each ton of recycled steel saves 1400 lbs. of coal and 2500 lbs. of iron ore (with 98% of mined ore used for making steel). And every year the recycling of steel saves the energy equivalent of electrically powering 1 out of 5 US households for one year. Why Build With Light Gauge Steel? Steel is Fire Resistant: Steel is stronger. More than twenty times stronger than wood. Steel is straighter, stronger, safer. Steel Avoids Mold: Building demands in the last 20 years have led to increased levels of sugar in lumber supplies, creating a diminished quality of wood that promotes an increase of mold problems in new homes. Hard to avoid moisture when you build on the open/on-site. One-third to one-half of all structures have damp conditions that may encourage development of mold. Source: U.S. EPA Eliminates outside air infiltration, leaks, drafts, dust, and quiet. Lower Maintenance Costs: Steel has lower maintenance costs. Experience substantial savings over long term. Less expensive because steel can save up to 60% on utility costs.. You will save $75,000. If you save $50/month, at 8% interest rate, how much do you think you will accumulate in 30 years. Lower insurance costs due to upgraded safety factors. Lowered maintenance costs due to material’s durability and resilience. Steel is dimensionally stable, so it’s not affected by temperature, humidity and climatic changes. And not only because of steel’s strength, but its resiliency and construction techniques as well, light gauge steel, unlike stick framed homes, can be engineered to the highest seismic rating available for residential buildings. Steel Offers Peace of Mind. Terminate termites (and other damaging pests) and fight fire with steel. Steel doesn’t rot, is fire-resistant, air-tight and not chewable. For decades steel has been the structure of choice for schools, hospitals, large apartment and commercial buildings. Relatively rare in single-family homes, steel’s superior quality, durability, strength and safety is now affordably available in your own neighborhood. Steel trusses are much stronger than wood and steel houses resist wind and seismic forces. How will your house look? 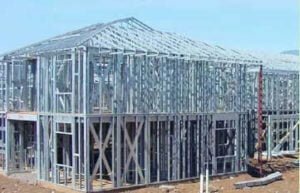 You can dress up your steel building with any material that you use with traditional wood stick framing such as any kind of siding Stucco/Plaster or any other material. What is Light Gauge / Cold-formed Steel? 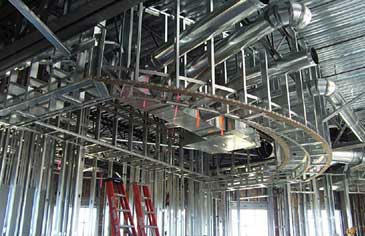 Unlike hot-formed structural I-Beams, neither process requires heat to form the shape, thus the name “cold-formed” steel. Light gauge steel products are usually thinner, faster to produce, and cost less than their hot-formed counterparts.